The idea that individual characteristics and disorders arise from complex interactions between genes and environment is so widely accepted today that it’s practically common knowledge — which makes it all the more remarkable that Irving I. Gottesman championed this idea more than 50 years ago. 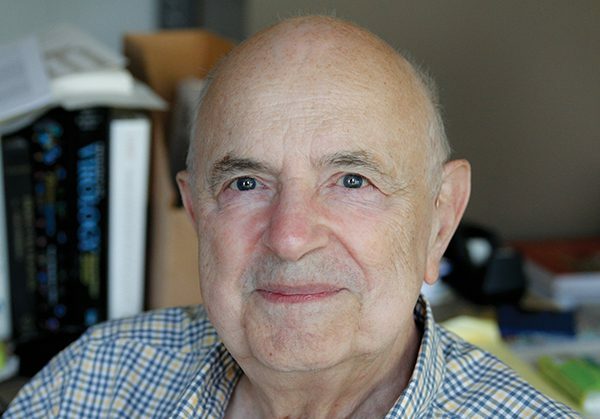 A special section in the March issue of Clinical Psychological Science pays homage to Gottesman, who passed away June 29, 2016, and highlights his many contributions to psychological science, both as a scientist and as a mentor. Just a few years later, Gottesman embarked on a groundbreaking program of research with collaborator James Shields — research that produced the now-landmark Maudsley twin study of schizophrenia. Just as with Gottesman’s previous work, the study was methodologically and conceptually rigorous, but it was by no means conservative. In contrast to the prevailing thinking among clinicians at that time, the researchers provided evidence for the genetic roots of schizophrenia, challenging the idea that the disorder resulted from “schizophrenogenic” mothering or other problems in the family environment. Over the course of their collaboration, Gottesman and Shields integrated the separate worlds of biological and behavioral research, applying the concepts of polygenic risk and endophenotypes to the scientific understanding of behavior. Based on their analyses of twin and family data, the researchers proposed that schizophrenia emerges when many small genetic influences combine to exceed a particular threshold. “Published at a time when most genetic researchers believed in a single major locus model of schizophrenia, this polygenic model remained very much a minority view until relatively recently, when it has been resoundingly affirmed by large-scale genome-wide association studies that have revealed hundreds to thousands of common genetic variants, each providing only a very small increase in risk,” Pogue-Geile and Lilienfeld note. In 2013, Gottesman received the APS James McKeen Cattell Fellow Award, honoring a lifetime of achievements in applied psychological research. That same year, he also received the Grawemeyer Award for Psychology, which specifically recognized his role in applying the multifactorial threshold model to schizophrenia. Commenting on a news item about the Grawemeyer award on the APS website, Gottesman noted that the credit was to be shared with his longtime collaborator Shields, who had died in 1978. The special section honoring Gottesman includes remembrances and contributions from his former mentees and colleagues, including: APS Fellow Lisabeth F. DiLalla (Southern Illinois University School of Medicine) and David DiLalla (Southern Illinois University), APS Fellow Keith H. Nuechterlein (University of California, Los Angeles), Carol A. Prescott (University of Southern California), Irwin D. Waldman (Emory University), APS Fellow Thomas J. Bouchard (University of Minnesota), Peter McGuffin (King’s College London, United Kingdom), and APS Fellow Eric N. Turkheimer (University of Virginia). Unanimously, the contributors remember Gottesman as not only a giant in the field of behavior genetics, but also as a constructive critic, supportive mentor, and vocal advocate for ethics in the use of genetic information.